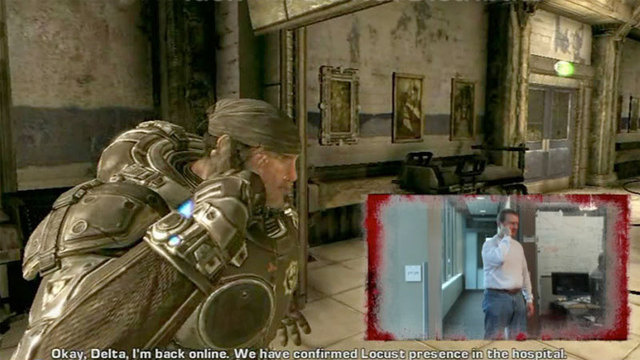 Gears of Halo - Video game reviews, news and cosplay : Gears of War Kinect to be set on a train? Kotaku says “Sources claiming to be familiar with the project” are saying that an early demo of the game used game assets and events from Gears of War 2. Oh, and surprise…it was set on-rails. I’m taking on rails to mean a train setting? The above picture is apparently from a beta version of the game but who know's if this is real or not. "A source also said that while the implemented Kinect functionality may not be fully worked out yet, the game will likely be an on-rails shooter. This means that players would have little to no control over the movement of their character, and would presumably use their hands to aim and shoot at enemies."